Mrs. Eileen A. Klos, 45 of 6 Dobson Road, Old Bridge died yesterday at St. Peter's Medical Center, New Brunswick. She was born in Brooklyn, New York, spent her childhood summers at the family's country home in Smallwood, Sullivan County, New York. She was the youngest daughter of the late Rudolph and Louise Alma Hundertmark. After her marriage in 1952, she moved to the Bronx, New York. In 1956, the then pregnant mother of two, moved to Old Bridge Gardens where she remained a resident until her demise, after a five year painful battle with breast cancer. Eileen attended Pace and Hunter College in Manhattan and set aside her academic studies to assist her husband in obtaining his Ph. D. from Fordham University. Her work was so prodigious that the University committee endearing awarded her a Ph.T. "Pulled Husband Through" after the successful dissertation defense. 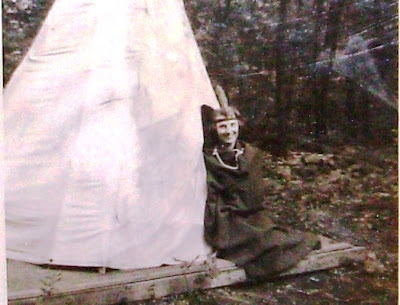 Eileen was best known for her work as a Girl Scout Leader. Serving first as a Brownie troop leader, her work through the ranks was so outstanding that she became a regional consultant to numerous Girl Scout Chapters, including Old Bridge, in the State of New Jersey. She was a parishioner of St. Thomas the Apostle Church, Old Bridge, a member of the Ladies Auxiliary to the St. Thomas Knights of Columbus, and a member of the Friendly Sons of Shillelagh, Old Bridge, New Jersey. She was a member of the St. Mary's School PTA, South River, the Democratic Party and a Middlesex County Board of Elections Board Official. Surviving are her husband Louis A.; two sons, Stanley, a student at Idaho State University, and James, at home; six daughters, Suzanne, a student at Montclair State College, Therese, Mary Louise, Patricia, Lucille, and Veronica Eileen all at home; one brother Gustav Hundertmark of East Williston, Long Island, New York, and one sister, Mrs Ruth Surat of Staten Island, New York. Funeral services will be held 8:15am Monday from the Rezem Funeral Home, Cranbury Road, East Brunswick, followed by a 9am Mass of Christian Burial in St. Thomas the Apostle Church, Old Bridge. Internment will be in Holy Cross Burial Park, South Brunswick. Friends may call 7 to 9pm tomorrow and 2 to 4 and 7 to 9 pm Sunday. 1907 - Robert Baden-Powell held a camp for boys at Brown Sea Island in Dorset to test his Scouting ideas. Scouting was born. 1908 - Scouting for Boys by Baden-Powell was published. Small groups of girls, undaunted by the title, started 'Scout' activities too. 1909 - Following the creation of the Boy Scout Association, Robert Baden-Powell organized a gathering of Scouts at the Crystal Palace in London, the first Boy Scout Ralley. A significant number of self-styled Girl Scouts attended the event seeking to imitate their brothers and join in with the Scouting phenomenon. They requested that Baden-Powell offer 'something for girls too'. Robert Baden-Powell publishes "Pamphlet A: Baden-Powell Girl Guides, a Suggestion for Character Training for Girls" and "Pamphlet B: Baden-Powell Girl Guides, a Suggestion for Character Training for Girls". These were precursors to the Girl Guide handbook. 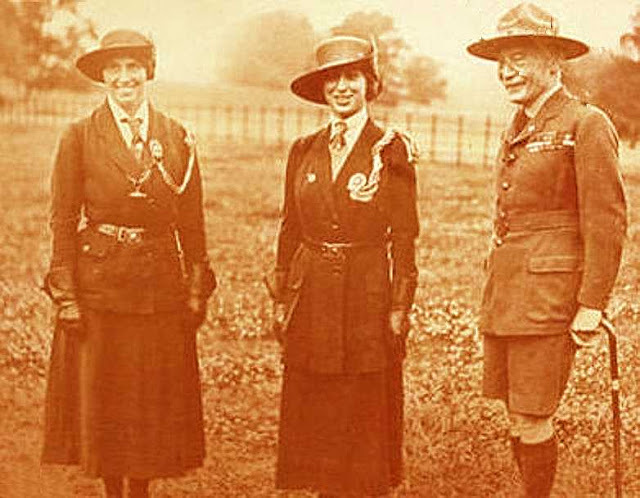 1911 - Juliette meets Sir Robert Baden-Powell, founder of Boy Scouts in England, and his sister, Agnes Baden-Powell founder of Girl Guides in England. 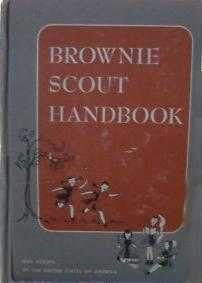 1912 - Agnes Baden-Powell creates the Girl Guides' first handbook. Entitled "The Handbook for the Girl Guides or How Girls Can Help to Build Up the Empire." Thanks Badge, an adult award, is introduced. 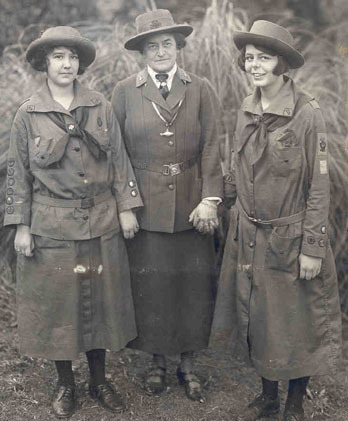 Jessamine Link established Magnolia Troop One, the second Girl Scout troop in the United States. W.J. Hoxie prepares the first official G.S. 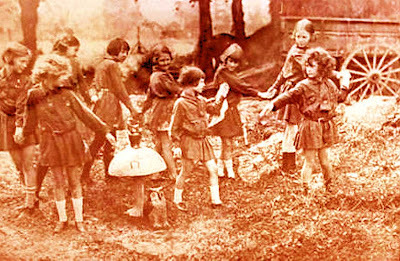 handbook, "How Girls Can Help Their Country"
June 1, National Headquarters established in Washington, D.C.
1918 - Design of the Girl Scout Pin to include the letters "GS"
First nationwide celebration of Girl Scout Week; the week beginning on the Sunday that included JGL's birthday, October 31. Juliette Low retires as President of Girl Scouts and takes the title "Founder of Girl Scouts"
Scouting for Girls, new handbook is published. 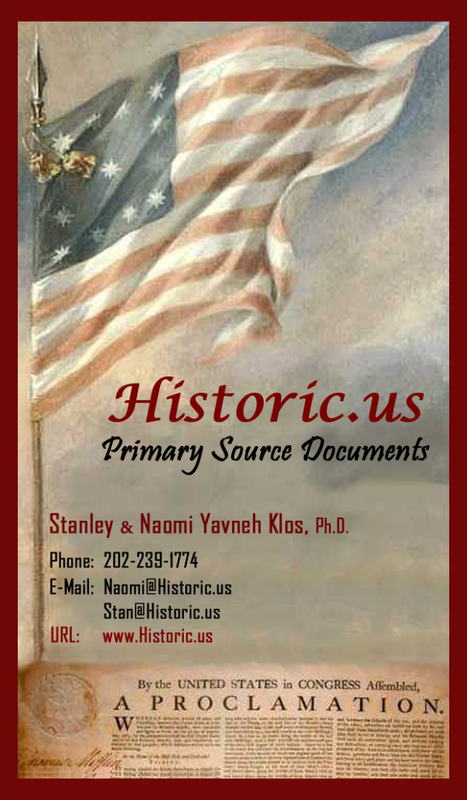 This was the first handbook prepared by the national organization rather than by Juliette Low. It included sections on map making, sewing an American flag, and marching according to U.S. Infantry drill regulations. On November 11, 1932, Girl Scouts baked & sold cookies for the first time in the window of the Philadelphia Gas & Electric Co. . This endeavor soon became a Philadelphia tradition. 1936 - Girl Scouts of the U.S.A. adopted the annual cookie sale as a national program. 1940 - Curved Bar award introduced. 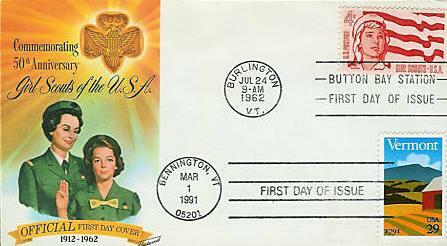 The Curved Bar was the highest award in Girl Scouting from 1940 until 1963. Open only to First Class Girl Scouts, it served as a bridge to Senior Girl Scouting. The embroidered arc patch was used at first because of metal shortage during the war. 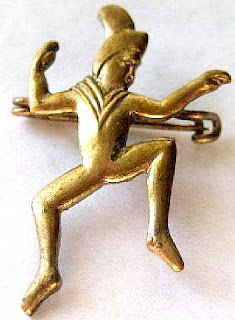 The Curved Bar pin, introduced in the fall of 1947, was used until 1963, when the award was discontinued. 1941 - The Wing Scout program was a Senior Girl Scout program for girls interested in flying and wanting to serve their country and ended in the 1970’s. 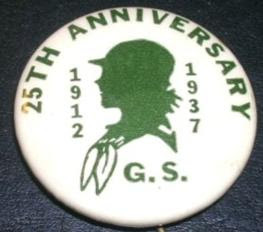 Under the new program introduced in 1963, the old Intermediate Girl Scout badges were divided into two groups to fit the interests and abilities of Junior and Cadette Girl Scouts. 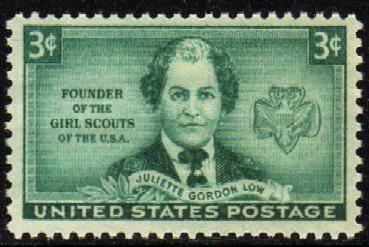 Junior Girl Scout badges (green borders) were aimed at exploration, rather than concentration on any given skill. Cadette Girl Scout badges (yellow borders) emphasized intensive work in particular areas of specialization. Ryukyu Islands Girl Scout stamp was released to mark the 10th Anniversary of the Ryukyuan Girls Scouts. The Ryukyuan Girl Scouts were united with Japanese organization after return of the islands in 1972. 1973 - Portrait of Juliette Low is bequeathed to the National Gallery in Washington, D.C.
1983 - The Juliette Gordon Low Federal Complex is opened in Savannah, Georgia. This is the second Federal building to be named after a woman. 1999 - Thursday March 11, 1999, a new honorary troop is formed consisting of women members of Congress. The event "celebrated the fact that two-thirds of all the female members of Congress serving today are former Girl Scouts." Independent Girl Scout are now called "Juliettes"
All levels were changed to have Girl Scouts as the beginning of their name, e.g. "Girl Scout Brownies" instead of "Brownie Girl Scouts", and all levels are by grade only instead of by age or grade. A new level, Girl Scout Ambassadors was created for girls in Grades 11 and 12 (around 16 to 18 years old), with Girl Scout Seniors to be only in ninth and tenth grade (around 14 to 16 years old) and grades for other levels were changed. The new levels were trialed in approximately 6 councils in Spring 2008, and began national use after 1 October 2008. 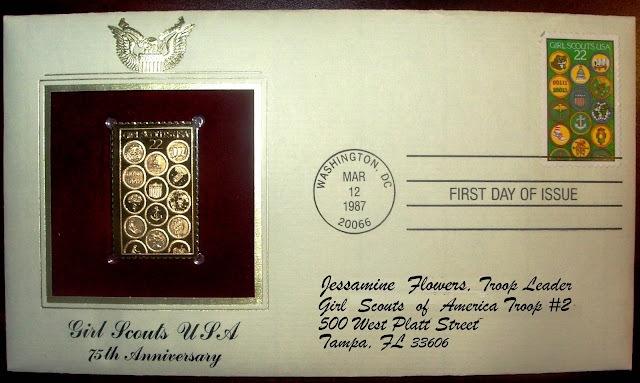 2011 – 99th Anniversary of Girl Scouts. 2012 – 100th Anniversary was kicked off by participating in the world famous Pasadena, California Rose Parade of 2012, featuring the GSUSA 100th Anniversary float. A multi-award winning float design company donated their services to design the float, that was constructed and decorated totally by GSUSA Volunteers of all ages. 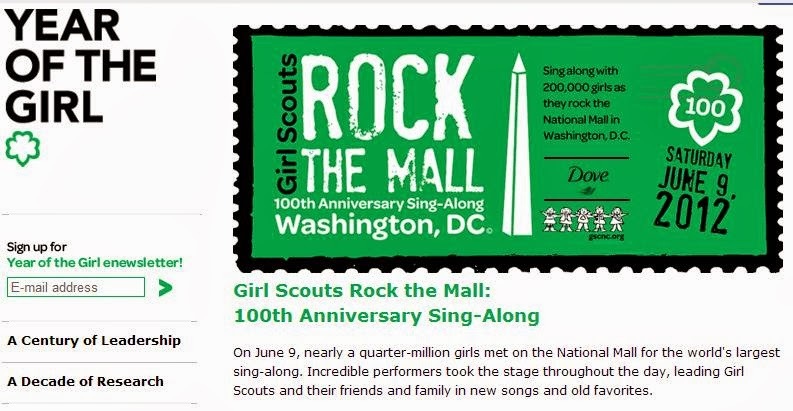 Girl Scouts Rock the Mall:100th Anniversary Sing-Along - On June 9, nearly a quarter-million girls met on the National Mall for the world's largest sing-along. Incredible performers took the stage throughout the day, leading Girl Scouts and their friends and family in new songs and old favorites. 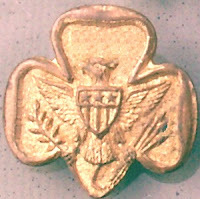 -- Image and text courtesy of girlscouts.org. For more on the 2012 Birthday Celebration click here.